Granby Elementary students recently celebrated all things 100 to commemorate their 100th day of school. 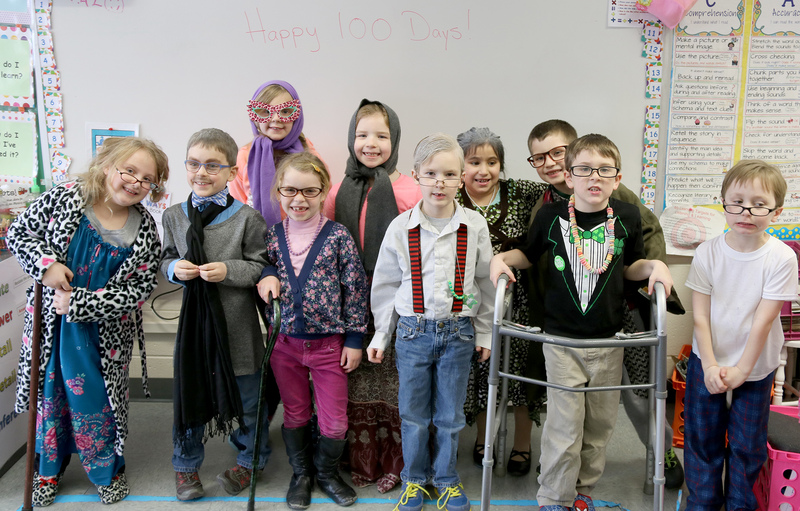 Students in Caitlin Besio’s first grade class show off their best 100-year-old look as they recently celebrated their 100th day of school. Students in Judith Rowe’s first grade classroom worked on math concepts via videoconference with another first grade class in Newark, NY, while several Granby Gators dressed up as if they were 100 years old. Some students used canes and walkers, dyed their hair gray and wore suspenders. Additional activities in some of the classrooms included writing 100 words and what they’d do when they turn 100. Students also made arts and crafts using 100 pieces of cereal or other small material.